Women could soon be allowed to serve on Royal Navy submarines for the first time. The Navy has deployed women on surface ships for over 20 years, but they remain banned from submarines for health reasons. However a leaked memo reveals that military bosses have dismissed these concerns and may be about to lift the ban. According to a report in the Sunday Mirror, the letter came from the office of the Fleet’s deputy chief of staff, and said: ‘The Navy Board is wholeheartedly committed to the principle of giving women the same opportunity as men. Of the 36,000 personnel in the navy, 3,400 are women, but have remained banned from submarines because of the dangers posed by fumes inside the vessels to a foetus if a woman is pregnant. The Navy has argued in the past that they could be pregnant when they go to sea, putting them and their unborn child in grave danger in case of complications such as an ectopic pregnancy, or forcing a commander to return home and abandon a secret mission. 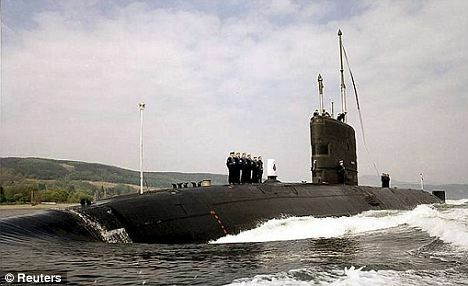 The Vanguard-class submarines which carry the UK's Trident nuclear missiles typically put to sea on patrols lasting four months or more without surfacing, while 'hunter-killer' submarines also remain submerged for months at a time on secret missions, gathering intelligence or shadowing suspect ships. The Royal Navy says there are also fears that chemicals in the air on board a submarine could be dangerous to a growing foetus and that the nuclear reactors could affect a woman’s body adversely. These risks have, however, been downplayed by a study conducted by the Institute of Naval Medicine and a Navy source told the Sunday Mirror that the ban may be lifted as early as next year. If the Royal Navy allows the move, only mine-clearance diving units and the Royal Marines would be closed to women in the Armed Forces. 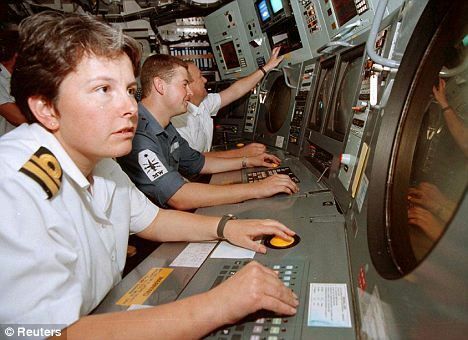 The U.S, Australian, Canadian, Danish, Swedish and Norwegian navies already allow women to serve on their submarines. My only worry is that ALL of the men will want to get them pregnant!!! In other news, for the first time ever, a woman was just raped on a submarine. This will end bad, mark my words. There is a basic hygene issue that is being overlooked. I am all for womens liberation and equality but there are certain jobs best left to men.